EVERYTHING YOU NEED TO HELP SCORE A PERFECT 800. Equip yourself to ace the SAT Subject Test in Math 2 with The Princeton Review's comprehensive study guide—including 3 full-length practice tests, thorough reviews of key topics, and targeted strategies for every question type. We don't have to tell you how tough SAT Math is—or how helpful a stellar exam score can be for your chances of getting into your top-choice college. 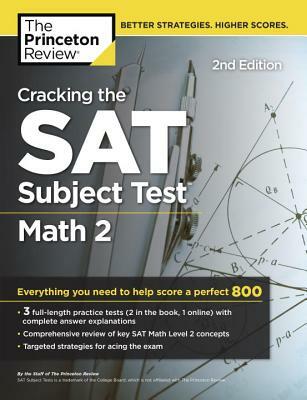 Written by the experts at The Princeton Review, Cracking the SAT Subject Test in Math 2 arms you to take on the test and achieve your highest score. The experts at The Princeton Review have been helping students, parents, and educators achieve the best results at every stage of the education process since 1981. The Princeton Review has helped millions succeed on standardized tests, and provides expert advice and instruction to help parents, teachers, students, and schools navigate the complexities of school admission. In addition to classroom courses in over 40 states and 20 countries, The Princeton Review also offers online and school-based courses, one-to-one and small-group tutoring as well as online services in both admission counseling and academic homework help.